An experiment is under way here in Wiltshire to find out more about Neolithic building methods. Using archaeological evidence unearthed from nearby Durrington Walls, three structures are being built at Old Sarum Castle, near Salisbury. 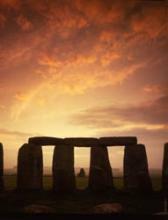 The final reconstructions will be built at Stonehenge later this year. They will be put up outside the new visitor centre. The recreated Neolithic buildings will form part of an “interactive and experiential” external exhibition at the 3,500-year-old World Heritage site. The Dorset-based Ancient Technology Centre has been commissioned to construct the three prototype homes.